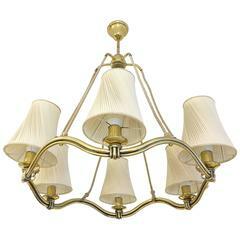 French (1940s) gilt brass ring form chandelier having 3 pair of scroll arms holding cylindrical frosted plastic shades and supported by 3 tubular rods connected to a canopy. 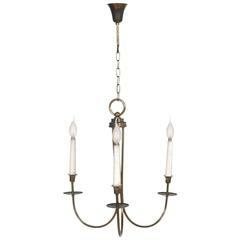 Italian Murano glass and brass chandelier. Total height with chain is 70 cm. 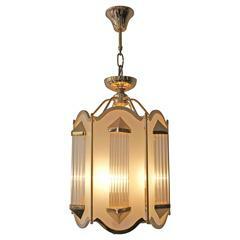 Chandelier with six frosted glass shades, frame in brass and black enameled brass. Marked with label on the inside of canopy; Arredoluce Monza made in Italy. A chandelier made in brass and lined with clear beads. Includes drapes of faceted beads, etched droplets and faux candles. In good condition. 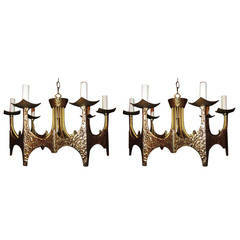 Pair of decorative Brutalist brass ring chandelier, circa 1950. 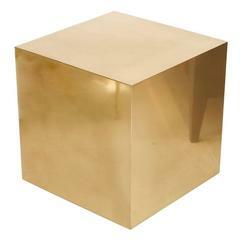 Wonderful hammered brass in a Gothic style-excellent vintage appeal.